I'm trying to follow this tutorial (http://www.circuit-bent.net/pss-270-tutorial.html) for my pss-190... but how do I cut the data lines on the chip?? On the schematic for the LED drivers, does the 9 volts come from the PSR's power source? And if so, where's a good point on the PSR's PCB to tap into? What better way to intruduce myself than resurrecting this thread - actually it was resurrected twice with no results. I registered for the sole purpose of sharing my own experience of bending this unit, and even though there are a couple of documented reports on the internet, this thread has even discussion on it and 2 examples with pics. Well. 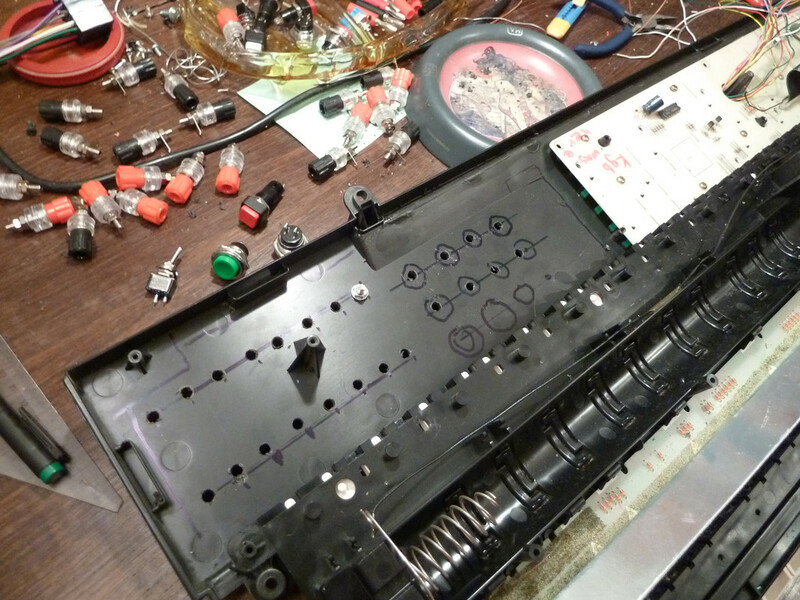 to make a long story short, 2 weeks ago I was reading on a circuit bending site, watching videos, and for the first time I felt I could do it. I had spotted a cool 1983 casiotone keyboard for a good price, mt-800 [yeah the one withthe rom cartridges! , got that actually, not bending it for now yet, its too cool as is, and I havent played it at all!] 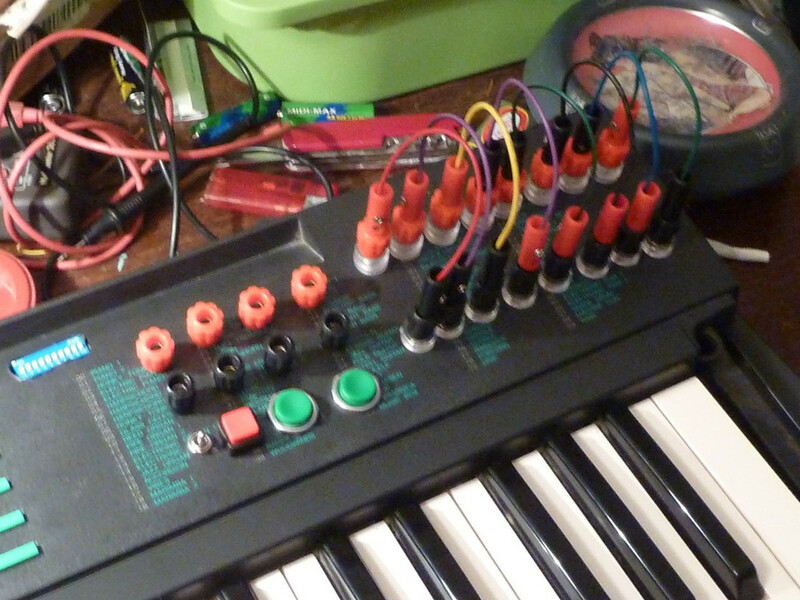 Anyways, I was into the looking for a cool and cheap second hand vintage keyboard to buy and all that, which is directly linked with circuit bending mentality. I knew about bending, I loved all the potential it created and all that it symbolises, but I did feel I was anywhere close to do it myself. I am lucky to have studied electricity, but I never really went with it, so my knowledge and even more experience in soldering, modifying circuits and even DIY modifying boxes and using a drill to make holes are not the best. 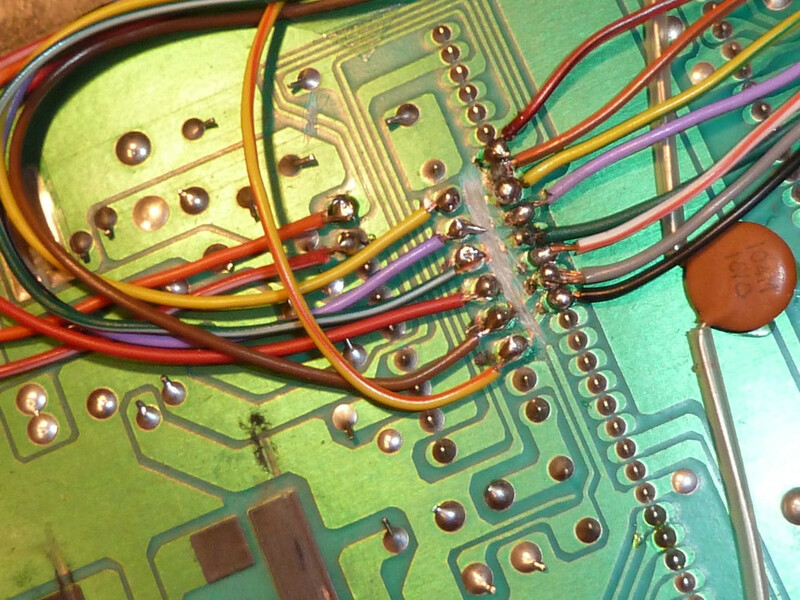 but in the mean time, some job of mine in a lab had involved some difficult soldering and I had practiced. Fast forward into the feature, reading about it. Couple hours into it I remembered my psr6 a friend of mine had to mess around, as I did not imagine it would be simple or even possible to modify more complex keyboards than those cheap small ones. To my amazement, I am finding out that almost everything can be bent, even smf circuits, if you got the hand/patience and equipment. I saw that some people had bent PSR 6 and I was trembling in excitement, as the mod with patch bay re-routting the 8 data channels from cpu to fm was both well documented and seemed to open up endless possibilities, almost too good to be true! So this is my childhood keyboard, my only one actually for many years to come. I never went along a lot with musical 'lessons' but I played a lot in it by myself. It is especially important for me to state and try to describe what this organ meant for me before going into details about this 'FM re route' bending , so exciting! So, this was a model from 1986, it was given as a gift frm my parents when I was 8 or nine I think. I had lessons for 2 years, then stopped as I did not like to study notes in written form. But I did continue to use it. So for years, this was the keyboard to mess around, even though I had got sick of its sounds and pretty limited rhythm range - let alone that the tempo up button was lost and I had to use a pencil or resetm or play up the demo to get the tempo up again, lol. Needless to say, I fixed this now, all these years afterwards, leaving the demo button hollow now. So, it is of great importance my intimate familiarity with this organs sounds, now that they are un scrabled! - this whole musical memories are bigger than even me can grasp. when I started to creat 4 channel songs in MOD amiga format in my 386 with a soundblaster pro 2 in dos enviroment, it was this keyboard I had aside to make up melodies and find the notes, and I even sampled some sounds from it too. Fast forward in to the future, pentium i and I began to use a midi controller / keyboard and the psr6 fell into oblivion, years later I gave it to a friend who used to play tunes in it for 6-7 years, never convinced him to teach him play chords too. He was worried when I asked it back, saying that I will make a surgery to it, and we all hope it makes it! In the mean time, me after doing mostly sequenced with little live recording [mostly guitar and noise/experimentations] for a decade, I started playing more live and jamming with friends, as I got more equipment, this time proper one: a roland sh 201 4 octave analogue modeling digital synth , a roland hpd 10 handdrum , a big mixer, studio monitors, pearl acoustic drums etc. So now that the dream, my childhoods dream is true, now that I have applied with some basic trick of circuit bending I see that it is possible to creat pretty interesting instruments by modifying existing ones for 20 euros or less! Onto how I delved into bending. It was that night, I read up and watched videos in youtube for over 8 hours in a row, till morning. And finding out there is detailed documentation of a superb bend for my psr-6, among other places in this forum. and also Mister for his version and nice comments, seems this dude was here for only a while. It would be cool to be able to contact to other people who have bent this keyboard and still have interest in talking and exchange opinions. Anyways I was not making my childhood keyboard my first 'patient' . I decided that I would buy acouple a couple toy keyboards with 10 euros, so I got two, which proved rather a bad idea, as you can find toys cheaper in the flee markets, but anyways I was too much in the hurry to bend something. So as I got more toys from a flee market and found more bending tricks and remembering what I had been tought , only a 2 week trip for me now, messing up with the pitch of cheap toys tranforming them easily into noise machines - I was thrilled and still am. I got pots, switches, buttons, push off buttons. its important for me, as I did study electricity but I never follwed it in profession, electricity itself, and nowdays it is the first time I get to understand more of circuits I never thought I could slightly understand and all this through bending. All in 2 weeks! 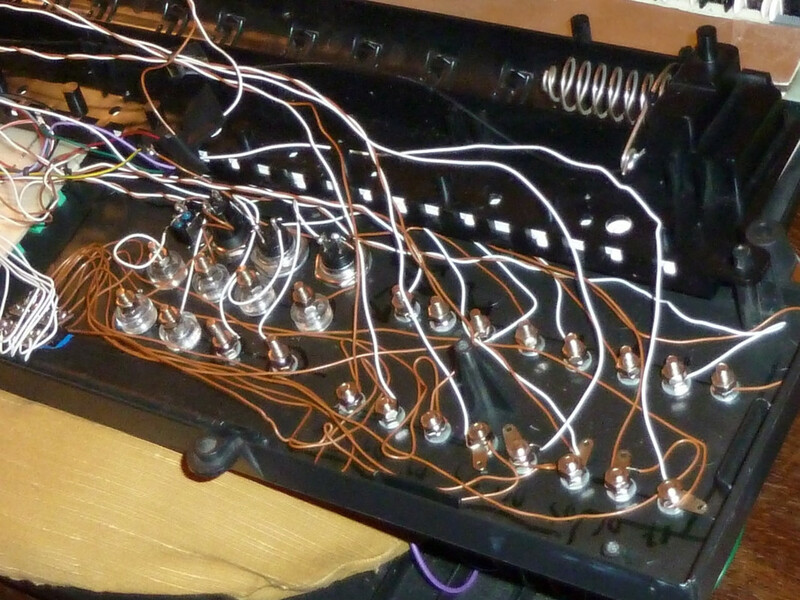 Circuit bending would be an awesome educational tool to trigger childrens imagination! So finally I got to do it , in three parts , in 3 consequtive days, working late all night till morning. 1) the actual testing of the tek and experimenting further : the best part of the process where you get to to see how channels work. I took the 8+8 contacts out to experiment. yep, I am the guy that wants to re-invent the wheel. In a rather simple bend in its concept which virtually splits the heart of the machine in two in your hands, I did not want to replicate the same thing, 8+8 patch bay plus 8 switches. And I also thought from the start the 8 switches were a bit unnessesary once you get to create a whole nice patch bay and increase the cost by 8 euros of an already risky experiment, and did not really helped in playability . these metal switches are neat but they are expensive, hard and relatively slow. Sure, switching on and off with the patch bay bridges is not nearly as fast as using switches, but the switches them selves did not seem to create so fast responses. Maybe switches offer an advantage when you want to switch back to normal, especially to prevent a crash or an irreversible noise which needs a power off to reset, but this is easily prevented by getting to know the channels alone. Then I first thought about this: I always can create assignable switches, lets say four, but you needn't have 8 switches, I thought , with half the channels off the keyboard barely responds or changes interestingly, at least that's what I think, we will see. I also thought of switches with multiple ends, but didn't use it in the realisation at the end. Still is a good idea. Any ways I wanted to see it for myself that it works before getting into design and buying the parts I did not already have. Like I said I thought and think it to be too good to be true to even hear the amazingly random messed up sounds generated in the same timbre of my childhood keyboard playing with the patch bay! Still cant believe it I made it! Not that there was something wrong with the other teks, technically and in terms of design they were far superior. On the contrary, the led thingy both people in the thread have created is both cool to look at and sure gives hints/data on how the sounds are created or when/how data signals are sent from the cpu. Sure is pretty basic if someone is to work more to understand / or make a pro bend interfering with synthesis directly. but an additional led circuit would be too much for me to build , haha, as the whole project seemed already difficult and I would be the most happy man on earth to only install the patch bay. In any case, any thoughts about the information the leds might gives us, if any, is not shared - if there where any findings at all, and is not further discussed, even though both people who bent psr in this thread did it. So I thought, buttons offer a faster alteration and its a digital signal anyways: even 1 third of a second connection alters the result as I saw with my pre-design tests. Luckily during I was processing the circuitry design in my mind and reading around, I read this awesome german expert dude again, regarding bending fm keyboards to create new sounds, suggesting replacing the 8 expensive switches with a dip switch, which I thought was a brillant idea, as it includes the initial idea of the 8 switches, only in a tiny compact version. its also nice as it can be used to save bridge cables in sessions and testing for new sounds, now you can switch on and off all channels fast, even though I suppose the dipswitch is not very hardy . More so, cutting some channels creates some pretty noisy results which some times , especially when the rhythm is turnt on, so they're best left connected, except from when we wanna noize around! resulting in an obligatory reset. their signal might probably be useful to connect to other channels though, but like I said, I did not play much. I start realising that the patch bay is more awesome than I first thought. First, it gives you the opportunity to test further [there's plenty of space left to add more features!] without opening up the case, while the keyboard is on. I noticed that touching with the hand the connects altered something in the initial tests, so a touch sensor and/or perhaps a potentiometer ? who knows? I bought a bread board though. So I placed the buttons [two x 2 green round ones] , one push off button [red square one] and a metal switch , all close to the middle, supposedly to increase playability, and it works! testing, more controls might be added in time. I suppose one could experiment more with more sophisticated lab equipment. What would be the way to manual trigger the sounds. shooting the FM with signal generator? Awesome experience overall, the bending, the exploring is yet to come. My keyboard, with all the momories it brings will now go through another time of use , again exploring music, in a different way this time! Even though it would still be cool to use with a effects pedal or multi effect, I would love my psr to have one or two tricks more , y'know, some bend, a distortion of a kind, so if any of you knows any good bend for thje psr-6, let me know. Cause I was afraid to experiment with it before, and now that I have successfully buld the assignable patch, I am afraid to interfere with the PCB more, now that its super cool. It would be cool to hear from ya guys, who showed your bent psr6s. I hope you taking all this raving and rambling and off topic ing in good heart , knowing this is a sentimental object we're talking about, not some keyboard I bought cause I found it cheap. Thanks to all the people who shared their infos and pictures. still haven't played with it to check the assignables. I did refer to the CTK 670 casio, and short circuiting ins and outs from 3 big ICs, especially the 2 of them where connected nexto each other, not unlike the CPu-FM layout in psr6. But there are lots more IC in this great CASIO keyboard and lots of experimentation to do to chose where from I take the glitch points. Anywayz my impression is, that beside the huge different in complexity and technology, was that ctk's clock worked many times faster than psr's, this by hearing the awesoime glitches. On the other hand, some dude had installed glitches in his psr-6, I suppose I just have to search for more bends and find it. Or even short circuit a data line to another part of the board, maybe to the output of the FM?? line 5 off : a kind of tone rhythm line with no drum sounds occur! I have not gotten into bending stuff myself, but I love to see the bent instruments and the sounds are wonderful. I am refering to stable patches, that can be replicated and do not crash the keyboard. 1) some really interesting drums/drummachine manipulation is pretty easy and archievable. also drum/accord mute button. 2) its pretty easy to start a patch of changing the bass tone of the accompaniament section. One can choose any of the 100 tones for the bass sound and some basses really sounds neat. 3) I was right push-off button is crucial in archieving some nice sounds that are actually archievable by will and not totally random. its really hard to guess what could go wrong with your keyboard. you're using an mains adapter? does the adapter work? are you using the right voltage and polarity? Wondering if anyone has done the LED circuit on the CPU side (rather than the FM chip side). I was thinking it could be beneficial to see what the CPU is sending rather than what the FM chip is receiving. Any thoughts on this would be appreciated. Thank you to all those that contributed to this thread. I wouldn't have even considered the LEDs if I hadn't found working examples of it here. Just picked up one of these guys and am planning on doing this bend, just wondering whether it would be worthwhile to add a row of voltage high patches or an oscillator so that you can send 1s or oscillations directly into the FM chip? just looking to open it up a bit further and possibly gain a bit more control over the bends.